What is A. A.? – A.A. There are four components to A. A. — 1. A ‘Fellowship’ (the members gathering for the purpose of being of service). 2. A recovery program (the 12 Steps) and 3. The book, ‘Alcoholics Anonymous’ – which describes with precise and specific instructions on ‘How the recovery program of A. A. works.’ — And, How to Recover. A. A. is ‘not’ just a Fellowship or ‘support group’ that has meetings to attend. A. A.’s real recovery program — has nothing to do with this ’90 meetings in 90 days stuff’. And, the ’90 in 90′ is not A. A. Also — when they went to the A. A. meetings — they went for the wrong purpose. We don’t go to A. A. meetings to ‘get help’ — We go to A. A. meetings to ‘to give help’ — ‘to be of service’ by trying to help others. “Giving rather than getting will become the guiding principle.” ~page 128, Alcoholics Anonymous. They went to many meetings (sometimes hundreds or thousands of meetings) – and didn’t stay sober. And/or — they didn’t get well. We get well in A. A. — ‘when’ we do the ‘real A. A. program of recovery.’ The objective is not just to stay sober — it’s to stay sober AND to get well. If you’re not getting well — you need to examine what you’re doing. Because you’re missing something. A. 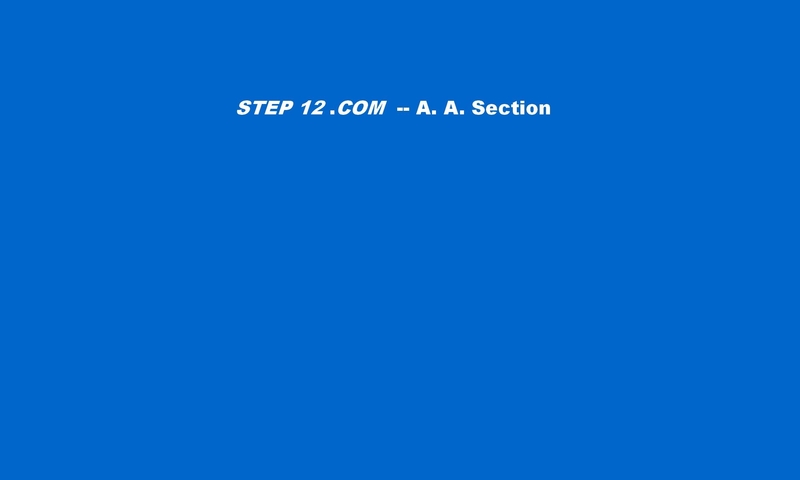 A. is ‘not’ just the practice of A. A.’s 12 Steps. A. A. is ‘not’ just a book with complete and precise instructions on how to work the A. A. program of recovery and how to recover. The Alcoholics Anonymous official program of recovery is: 1. The Fellowship. 2. The Program. and 3. The Book, Alcoholics Anonymous. And — I suggest it’s… Something More! What is the Fourth Component – that seems to never get discussed? You’ll find it on page 164 of the book, Alcoholics Anonymous. It’s ‘another Fellowship’ called ‘The Fellowship of The Spirit’. ” Abandon yourself to God as you understand God. Admit your faults to Him and to your fellows. Clear away the wreckage of your past. Give freely of what you find and join us. We shall be with you in the — Fellowship of the Spirit, — and you will surely meet some of us as you trudge the Road of Happy Destiny. The only requirement for membership is a desire to stop drinking. There are no dues or fees for A. A. membership; we are self-supporting through our own contributions. For that reason, A. A. concentrates on helping those who are already alcoholics, so that they can stop drinking and learn how to live a normal, happy life without alcohol. A. A. believes, if the alcoholic does not stop drinking, their alcoholism almost always gets worse and worse. Alcoholism is a two-fold condition: physical and mental. Physical: The physical body of an alcoholic reacts differently to alcohol –than the body of a non-alcoholic. Similar to how a diabetic reacts differently to sugar and carbohydrates – than a non-diabetic. A metaphor that has been suggested is: the physical reaction is similar to how a person that’s allergic to strawberries – reacts differently than a person’s body – who is not allergic to strawberries. Or, how the body of a person who is allergic to bee stings – will react differently to bee stings – than the body of a person who is not allergic to bee stings. Mental: If a person knew they were allergic to strawberries and their experience had shown that eating strawberries lands them in a hospital and a doctor has told them that if they eat strawberries again, it will likely kill them – it’s logical to conclude that this allergic person would never eat strawberries again. Especially – when this had happened again and again and again and again. They would remember their previous episodes with strawberries – and not eat them. They wouldn’t obsess on trying to come up with different ways to try to eat strawberries again – without it killing them. They would just stop eating strawberries. And never eat them again. It’s the same with a non-alcoholic, who has had numerous problems while drinking again and again and again – and they rightly conclude “this doesn’t work well for me. I don’t care for the problems alcohol is causing me – so I’m not going to drink like this again.” And, they stop and stay stopped. Or, they try to moderate, and they are able to control it – and not drink until it creates a problem — again. With the alcoholic – there seems to be a strange mental twist in regards to their thinking about alcohol. They remember all the problems alcohol has caused. They know from their previous experience what will happen if they drink again. The mental condition of the alcoholic appears to operate in an ‘unconscious’ area of the mind. And they are telling you the truth. They don’t know how or why they started drinking again. They had no reason and no excuse to start. But they did – start. Both science and medicine will occasionally think they’ve solved the problem. They’ve invented some pill or treatment that appears to work. They begin mass marketing the solution – and a few years later, they discover: “This isn’t working!” They’ve tried shock treatments. Lobotomy. And all sorts of ‘tricks’ that work on non-alcoholic problem drinkers – and it works for them. But that small percentage of ‘real alcoholics’ baffle them. Because their treatments don’t last – for the non-alcoholic. Time, after time after time after time – the ‘real alcoholics’ who have solved their problems tell science and medicine ‘the only thing that works is total 100% sobriety all the time’. A little always leads to ‘not enough’. A. A. believes that total and complete sobriety is all that works for the long-haul. The alcoholic must not get started on their ‘next first drink.’ And that’s what their recovery program stresses. One alcoholic helping another alcoholic to not have the next first drink. There is no such thing as ‘moderation management’ or ‘controlled drinking’ — that will work for the alcoholic. A. A. — Alcoholics Anonymous is a worldwide fellowship of men and women who help each other to stay sober. They offer the same help to anyone who has a drinking problem and wants to do something about it. Since they are all alcoholics themselves, they have a special understanding of each other. They know what the illness feels like — and they have learned how to recover from it in A. A.